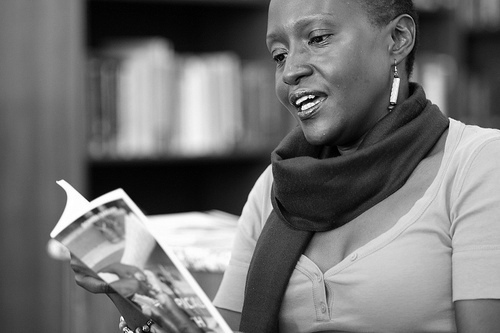 Doreen Baingana is a Ugandan short story writer and editor. Her book Tropical Fish won the 2006 Commonwealth Writers’ Prize, best first book, Africa Region, and the AWP Award for Short Fiction (US). She won a Washington Independent Writers Fiction Prize and has twice been a finalist for the Caine Prize for African Writing. She was managing Editor at Story Moja, and was one of the 2013 Commonwealth Short Story Prize judges. In 2013 she delivered a TEDtalk about “The role of offensive language in novels”. Baingana’s work has appeared in AGNI, Glimmer Train, African American Review Callaloo The Guardian, Kwani? and on BBC Commonwealth stories. Her book Tropical Fish has been published in the US, South Africa, Nigeria, Kenya, Uganda and most recently came out in Swedish translation. She has taught creative writing at various institutions including the University of Maryland, the Writer’s Center in Maryland, the SLS/Kwani? Literary Festival in Kenya, and with Femrite in Uganda. Baingana has won the Washington Independent Writers Fiction Prize and is a two-time finalist for the Caine Prize for African Writing. She has received fellowships and scholarships to the Bread Loaf Writers Conference and the Key West Writers Seminar, and an Artist’s Grant from the District of Columbia.